Since the late 1980’s I have been building and designing custom wiring harnesses, swapping and diagrams. With an advanced knowledge of electrical systems, wiring parts together to achieve something new, make repairs, and restoration is simple for me. 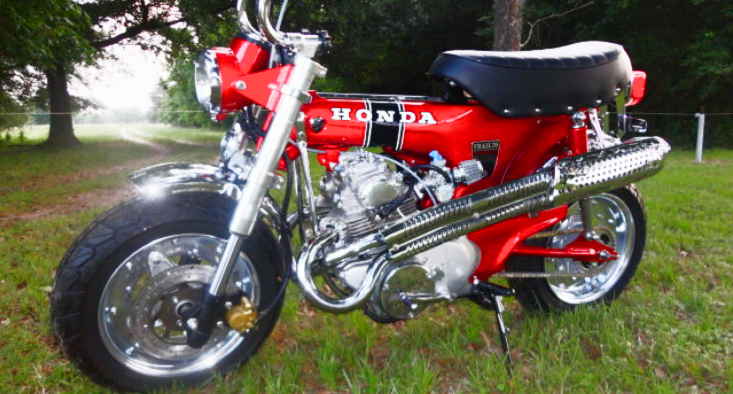 Use my ability to take some of the dread out of wiring your custom built or restored motorcycle. I can help you understand in simple terms how to troubleshoot and wire your own bike. Every build is different. Every builder has their own ideas for how they want a bike configured. There are thousands of wiring diagrams on the internet. You can suffer the pain of poring through the mismatched details, wondering if that last diagram you found on the internet is the solution you need… or consult with a professional. 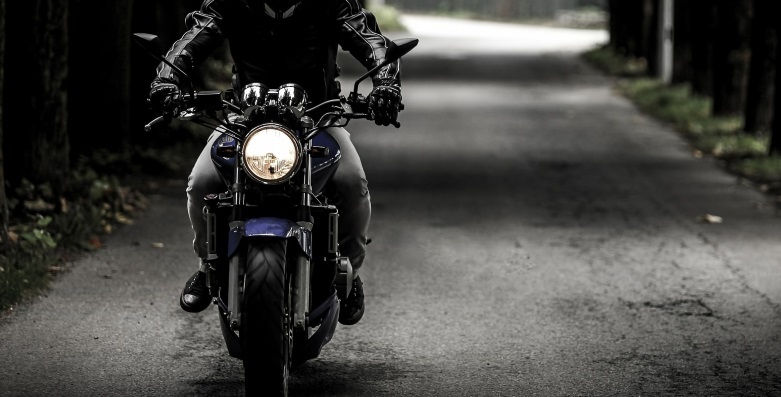 For a reasonable cost you can take all the guessing out of the equation and have your own custom, personalized motorcycle wiring diagram created for your bike. Stop wasting time and effort looking for the perfect wiring in someone else’s playground. Quit bypassing adding on that cool feature because no one seems to know how to get it done. Whether you are a custom shop or a home builder, you can have your design done right. 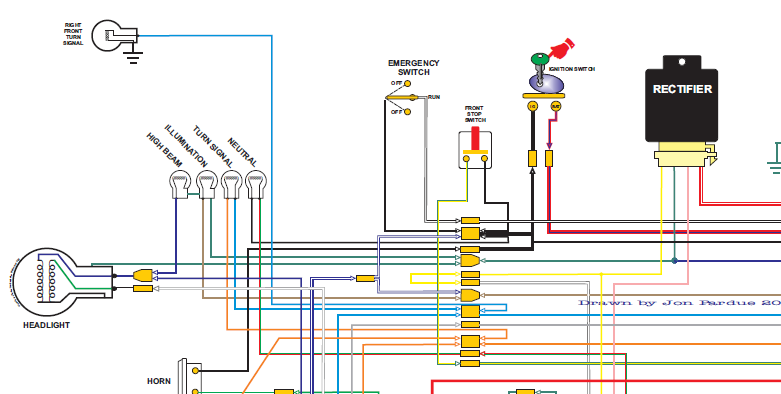 I will draw your wiring diagram in high resolution, a beautiful PDF that zooms in cleanly for massive detail. You won’t go blind trying to follow the connections. Whether stock or custom, that maze of wires is much easier to see when it’s the exact machine you are working on. If the charging system won’t handle that 4 million Watt military headlamp you found at the boneyard, I will tell you. If you must have it anyway, I will help you get it working. I always design using stock wiring colors on restorations. On customs I can use whatever photos you have of your parts, staying stock as possible. When building a custom, often you need 2 or more colors involved to complete a circuit, so the diagram, I develop for you embraces the various colors and shows proudly how its all wired together. 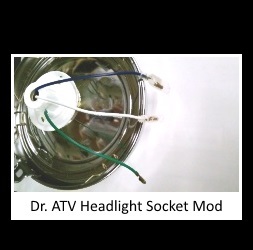 I’ve helped thousands of bike builders with their electrical system. There are important advantages to wiring your own bike, like the personal satisfaction of completing the entire build yourself. You have a greater knowledge of why the systems work and how to troubleshoot them. At any time you can enlist my help to make changes, upgrades, or repairs. It’s a sweet peace of mind that you can handle emergency road repairs. Shoot me an email and tell me what you need. You may wonder if something is even possible, or just want to know if a part from one bike will even work on another. Its free to ask, and I always reply at no cost.